Cameras in the printing industry are used to make negatives which are used to generate plates which then become a part of most printing processes. Most of the camera work in a printing plant is done shooting "line" copy, or your "camera-ready" copy. Most print shops today no longer use or even own a graphics camera. The most common method used to convert photographs into printable form is with an image scanner. The scanner will accept black and white or color photos, or even actual objects. With our specialized software, we can edit, retouch or enhance pictures to replace unwanted areas with a new background, combine two or more photos into one, or even create special effects to turn an ordinary photo into a dazzling new piece of artwork. After the computer has captured the images and they have been "cleaned up" or changed appropriately, they are usually combined with text, other graphics, charts, tables or whatever other information is necessary to complete the page, and then output. The first device this data is usually output to is a laser printer or a color proofer. After it has been carefully inspected, it is then sent to our imagesetter where we produce a paper proof or film negative which again is usually used to make a metal printing plate. We also have the ability to make plates directly from our imagesetter which eliminates several steps in the platemaking process thereby saving us time and materials, and saving you money! In a halftone, a dark area is composed of large dots, a light area will have very small dots, and all the gray areas in between will have larger or smaller dots accordingly. You can see the dot pattern of this halftone in the magnified area. The photos on the left were scanned from regular 35mm "snapshots" using our image scanner. 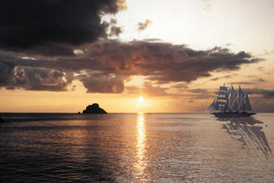 Notice how we took the clipper ship from the top photo and put it in the sunset photo below. We then adjusted the colors and added the shadow to give the composite picture more realism. Our extensive software library is continually being expanded and updated. We have the ability to convert many popular page layout, image manipulation, drawing and word processing files into professionally-printed materials!